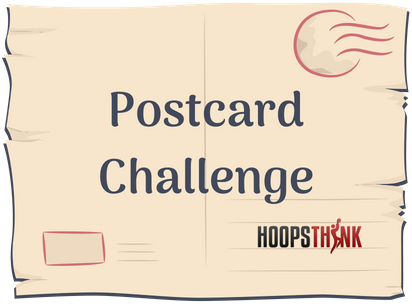 Now that we’re firmly into the summer season of the NBA for 2018, let’s recap the NBA Draft — and even more exciting, our first Postcard Challenge! So let’s go over some 2018 NBA Draft scouting reports. I received a good number of entries, including one from Portugal. So I want to thank everyone who took the time to write and send me an evaluation of a 2018 NBA Draft prospect. I approach this recap by highlighting several players from the 2018 NBA Draft class with evaluations from entries. I provide feedback and suggestions on these reports. It gives the people who wrote the evaluations a chance to get their work out there while receiving advice and constructive criticism. People reading along can see examples of how to work and what to look for. At the end, I announce the prize winners. Three runners-up receives access to Basketball Scouting Crash Course, the six-lesson video class I created to help you learn more about how to scout effectively. One winner gets that in addition to a one-on-one mentoring call with me. In case you missed the articles describing the criteria, I judge entries mostly on one criterion: How well do they answer the most important basketball scouting question? That is, what can this player do to earn minutes at the next level? So that’s what we’re looking for. And it’s got to fit on a postcard. With the fourth pick in the 2018 NBA Draft, the Memphis Grizzlies select Jaren Jackson Jr. from Michigan State University. Our JJJ evaluation comes from Max Levy in Dallas, TX. Excellent agility allows him to be able to guard multiple positions as 6’11” big, along with his length, which will allow him to be a stronger rim protector along with his solid 236 lb frame. Quick and fluid release, along with consistent range + accuracy will allow him to stretch the floor, and if he gets fouled, he’ll convert at the FT line, shooting 80% in college. Jackson Jr. guards multiple positions. He provides floor spacing and can hit the outside shot. He’s reliable at the charity stripe. This report from Max tells you right off the bat exactly what Jackson Jr. provides as a player. It would help to hear a little more about Jackson Jr.’s defensive chops here. Max specifically cites the prospect’s agility and length as enabling him to guard multiple positions, as well as being able to protect the rim. But defense requires mental tools in addition to the physical ones. This evaluation doesn’t cover that area. It puts the reader in a position where they don’t understand fully how the player’s physical tools translate to on-court play. It’s a helpful report and this area is one to improve upon. With the sixth pick in the 2018 NBA Draft, the Orlando Magic select Mohamed Bamba from the University of Texas. This report is courtesy of Kevin Ayoola in New Jersey. Mo is an excellent athlete who has potential to help a team. He is probably a top 5 pick. If he goes number 4 to Memphis he would have to get stronger. If he can get stronger to be able to defend in the paint he can earn nice minutes off the bench. Being a shot-blocker and rebounder could be his niche early. Mentioning that Bamba is a great athlete and that it’s connected to him helping a team is definitely something a good report ought to do, so Kevin covered that base. What I’d like to see more of is a clearer explanation of how the questions of athleticism and strength relate to his ability to contribute to an NBA team in the near future and what we can expect his current status to be. Kevin wisely hints at it, alluding to questions of Bamba staying out of foul trouble (which is certainly something to look for with Bamba in the NBA) and being strong enough to defend in the paint. But more clarity here would be helpful. “If he can get stronger to be able to defend in the paint he can earn nice minutes off the bench.” I don’t know if I should take this to mean that Bamba can’t play off the bench at this point — meaning, not until he gets stronger. I imagine that would be alarming, if it ends up being true, for the Magic, who drafted him sixth overall. So when covering these aspects of a player’s skill set, you want to keep in mind to communicate exactly how these different pieces back up the prospect’s ability to contribute (or not contribute) at this time. With the eighth pick in the 2018 NBA Draft, the Cleveland Cavaliers select Collin Sexton from the University of Alabama. Thanks to Darryl Revels from Phoenix, AZ. Collin Sexton can earn minutes at the next level by just respecting the game level of the NBA, using his high basketball IQ, improve his defensive prowess, stay coachable and humble in his spirit of God. He’s ready to contribute and play minutes immediately! He’s a surefire 1st round pick. All of these observations matter. Sexton must, among other things, stay coachable and humble and be smart on the court, while improving on the defensive end — especially with the Cavaliers in flux after LeBron James’s departure to sunnier skies once again. This evaluation leaves me wanting more pieces that are unique to this particular player. The above observations could be said about almost any prospect. Rookies need to be coachable and humble and they almost always need to improve on defense. Sexton’s high basketball IQ that Darryl points to is one helpful distinguishing feature. I simply find myself wanting more. Joshua Reyes from Arizona writes in with this report. Mikal Bridges can earn minutes in his first 2 seasons in the NBA because of his 7’0 wingspan, his lateral quickness on both sides of the ball, and his pure explosiveness when attacking the rim. He has a high arcing shot that helped him shoot 43% from the 3 pt line (18th in the country). His 7’0 wingspan creates problems in the perimeter forcing bad shots. He has a great ability to switch on any pick and roll and defend multiple positions on any area of the court. I believe he’s the best defending guard in the draft. He paints a compelling portrait of Bridges as a player. We quickly learn that Bridges is long and athletic — a good switchy player for today’s NBA that trends in that direction. Furthermore, Joshua tells us that these tools translate especially well to the defensive end. The report leaves me with a couple questions. It’s the responsibility of a scout to try to anticipate what questions someone will have of a prospect and address them preemptively in the report. Why exactly does Bridges’s wingspan lead to bad shots in the perimeter? It is intuitively obvious on one level that a longer wingspan makes it easier for a defender to contest shots. It’s also true; however, that it can discourage those shots from occurring in the first place. Guys are afraid of having their jumpers blocked! I find myself curious about what happens with Bridges here. That answer isn’t given within the report. Some defenders are good at baiting their opponent into thinking they have more room to shoot than they do and then surprising by closing the gap, for instance, but I don’t know if that is what Joshua is getting at here. Is Joshua saying that Bridges has a great ability to switch — and be the best defending guard in the draft — solely because of his wingspan and lateral quickness, or does he also have other intrinsic skills that make it so? For example, maybe Bridges does a terrific job anticipating screens and knowing when to switch and closes down on passing angles in the process. Again, I don’t learn the answer here. In this case it leaves some doubt as to whether Bridges is actually great at switching or if Joshua merely means that he has the physical tools to be great at switching. Anyone who keeps this idea in mind when writing scouting reports and tries to practice it will write much better, more helpful reports in the long run. With the 21st pick in the 2018 NBA Draft, the Utah Jazz select Grayson Allen from Duke University. Here’s Roy Silva from Portugal with the report. To conclude, I think he can earn +/- 10 min and be really useful in the NBA. Roy does a good job hitting on the highlights here. Each of his points contributes a piece to answering the question, What can this player do to earn minutes at the next level? We see from his report that Allen brings a few useful things to the table on both ends of the floor. Furthermore, Roy contextualizes the defensive questions by letting us know what kind of player he thinks Allen can defend. I have similar feedback here to what I said to Joshua above with his Mikal Bridges report. Particularly when a player is as well-known as Grayson Allen, it’s good to understand that your audience might come in with preconceptions (right or wrong) about who that player is. Still, many people have the perception that Allen might not be a good enough athlete to be an attacking three-and-D player of the type Roy describes in his report. So questions of his athleticism are kind of the elephant in the room here. Especially in cases where you know going in what reservations people might have about a player, you want to get out ahead of those concerns and address them one way or another in your report. Great job overall, Roy — thanks! With the 31st pick in the 2018 NBA Draft, the Phoenix Suns select Elie Okobo from Bordeaux, France and Pau-Orthez club. Max Levy is back to cover Okobo with the second of his two entries. Near 30 foot shooting range and excellent shot creation ability with decent conversion consistency. Passing ability is surprisingly good for a scoring PG, has better assist to turnover in French league than Frank Ntlikina in far more minutes and volume than Frank’s last season. Also has past history of being off ball guard, allowing him to coexist with another creator if the need arises. I like how this report brings in a specific comparison to a similar player in the same league just a year or two ago. I’m not big on player comparisons in an overall sense. Here though it helps to bring up a particular example when trying to add context to an element of a player’s performance or skill set. Max paints a compelling picture of who Okobo could be as an offensive player and what roles he might fill. What I would like to see is a little more specificity with a couple of the superlatives. Max describes Okobo’s shot creation ability as “excellent” but leaves it up to the reader to guess what makes it excellent. Is it his quickness or first step, or something in particular about his ball-handling skill? I understand this report isn’t supposed to be long and comprehensive. What I find is you can usually replace a superlative with a helpful explanation without adding more than a few more words. For instance, instead of “excellent shot creation ability,” you share an observation such as, “Explosive first step and tight handle allow him to create shots regularly.” Only eight more words and they tell you a lot more. And in a longer report, you’d break that idea down even further. Rather than settling for a “tight handle,” you might discuss how he makes great use of hesitation dribbles to create space, and so on. It’s also unclear what the implications of Okobo’s “past history of being an off ball guard” are. We know from earlier in the report that he stretches the floor, so that’s a factor here. But it’s left unknown what Okobo does away from the ball to contribute. Appreciate your good work, Max! With the 38th pick in the 2018 NBA Draft, the Philadelphia 76ers select Khyri Thomas from Creighton University. (The 76ers traded Thomas to the Detroit Pistons. For this report, we turn to Andy Huynh in Santa Ana, CA. Khyri Thomas will earn minutes in the NBA with his cerebral play on the defensive end. KHRYI-FENCE! The reigning Big East DPOY feels like the remix to Kris Dunn (2016 Big East DPOY) with his defensive competitiveness and freakish 6’10” wingspan for his 6’3″ frame. However, he’ll surpass Dunn’s NBA MPG by a land slide, possessing a superior jumper along with an improving shot selection evidenced by his three years at Creighton (47%, 50%, 54%). His stock ranges from 14-20, showing great character in draft interviews. Atlanta or San Antonio are great fits with their backcourt situations. Andy brings a laser focus in this description of Thomas’s gift. Then he flows into an acknowledgment of one of Thomas’s shortcomings while pointing out he demonstrated an ability to improve in that area during his time in college. This point matters more than you might think on the surface. When you try to weigh how much a player’s weaknesses take away from his strengths, you want to think about how likely he is to improve in that area. While some (lazy) scouts will settle for guesswork or imagination in making that determination, a good scout looks for evidence one way or another. When dealing with a three-year college player such as Thomas, Andy makes a wise move in citing a demonstrated knack for improvement already. I must mention though that when citing stats, you have to be careful about what they’re conveying. How sure can we be that Thomas increased his percentages due to shot selection rather than simply getting better at shooting? If you looked at his free throw numbers, for example, you’d see that he improved from 52.1% as a freshman to 76.5% as a sophomore and then 78.8% in his final year. So there’s definitely some indication that his overall shooting ability got better. I also look for more detail in this case. What about Thomas’s shot selection improved? Sometimes this summary means that he took more shots at the rim instead of long midrange jumpers — but that’s not necessarily what it indicates. I come away wanting more information on those lingering questions. When making these notes, it’s good to take an additional step back and think about whether your observation raises additional questions that your report doesn’t answer. If you have the space/time/ability to answer those questions, do it. In this case, that space might have been better spent on these questions than in presenting Thomas’s overall draft stock and fit, which are a little outside the scope of what the original assignment called for. Really good work here, Andy. Thanks again! Here’s Jonathan Zuck with the report. Thanks to Jonathan for this scouting report, which covers some good ground. We quickly learn that Vanderbilt profiles as a small ball big who can hold his own on the boards, guard multiple positions, and operate as a dive threat while being able to do a little with the basketball when he needs to. It’s great that Jonathan touched on all these positive components of Vanderbilt’s game. Even keeping in mind the limited space offered by a postcard-sized report, a little more detail with some of these insights would come in handy. It helps to squeeze in more specificity and detail where you can, so long as it enhances your point instead of taking away from it. Thank you, Jonathan! This report communicates a lot of important information about the player and does a great job answering the question. With the 58th pick in the 2018 NBA Draft, the Denver Nuggets select Thomas Welsh from UCLA. Tom Barket comes through with this evaluation. A solid shooter from all spots. When open, has quick release and shoots w/confidence and accuracy. He keeps pace and has above average agility for a big man. Excellent pick and pop guy from beyond 10 feet to 3 pt line. A solid trail-shooter in transition. Also, keeps ball in play w/a soft-touch on blocked shots. Possesses a creative, wrong foot, low-post fall-away shot. I like what Tom brings to the table in this report. He hits on the important components of Welsh’s skill set while communicating enough detail to be descriptive. For instance, Tom doesn’t leave us wondering how Welsh will contribute as a shooter. Tom mentions Welsh’s quick release and the situations in which he’s most likely to be able to shoot with accuracy. He gives us descriptions of Welsh’s skills that distinguish him in a meaningful way. He doesn’t leave much open for interpretation. The only thing I find myself wondering — a little — is what to expect from Welsh’s patented low post move Tom refers to. Tom’s mention of it implies praise but doesn’t suggest the frequency with which Welsh might be able to get it off or how effective it might be at the NBA level. I’m nit-picking there. It’s a good report. Nevada’s Caleb Martin and Cody Martin have pulled their names from the NBA Draft, per reports. I said that I wouldn’t hold it against anyone who picked a prospect who ended up pulling his name out of the draft. I’m true to my word! Here’s Enzo Sison with an evaluation of Cody Martin, who returned to the University of Nevada for his 2018-19 senior season. He’s listed as a SF, but I really think he is capable of playing the point at the next level based on his college performances. To earn minutes at the next level, Cody needs to utilize his great vision in order to still have an effect on offense when he’s not scoring. He needs to always put pressure on the rim when he is off the ball and especially on. Aggressiveness is key! Defensively, he needs to work on his footwork, but he’s already a great defender. Hopefully, he can keep up with the physicality of the NBA. Thanks, Enzo! I appreciate you covering a less familiar name for many people. Here’s nice work bringing to light Martin’s skills and being willing to consider him for a less than straightforward role. I think if you’re going to suggest a player like Martin sliding to play point guard at the next level, you need to bring more depth in describing what makes that move possible. The obvious thing you wonder when this subject comes up is whether the player in question as the size/quickness — the physical tools — to make such a move possible. Enzo abstains from commenting on that, so we’re left with uncertainty about it. It doesn’t tell me why he’s characterized as such or which positions he guards. Especially considering the uncertainty about which position he plays on offense, it’s that much more important to know where he slots in on defense. Appreciate what you brought to the table here, Enzo! Tough decision for me. Thanks again to everyone who entered. I received many good entries with 2018 NBA Draft scouting reports! I chose Joshua Reyes (Mikal Bridges), Roy Silva (Grayson Allen), and Jonathan Zuck (Jarred Vanderbilt) as the three runners-up. They did a great job with their reports. I appreciate how well they answered the question and the level of insight they contributed. Tom Barket (Thomas Welsh) emerged as the overall winner here. I felt that Tom did a terrific job focusing on what Welsh does to help a team and also on things that made Welsh notable and unique as a player. I hope to run the Postcard Challenge again next year. In the meantime, thanks again to everyone who took the time to write and send me a report. I thought we had a good collection here of 2018 NBA Draft scouting reports. It’s my goal to use this opportunity as a way to help people practice while getting feedback, as well as providing examples and insight for other people reading along. I’d like to do more of this stuff. If you’re not already on the HoopsThink mailing list, sign up using the form below to get updates about what’s happening!